Episode Review: SPARTACUS: VENGEANCE, "Empty Hands"
I think it's pretty safe to claim that "The Greater Good" was the best episode of the young season, so whatever had to follow it up had some big sandals to fill. While "Empty Hands" wasn't as strong as its predecessor, it was still a decent entry in the Spartacus catalog. Spartacus, Mira, Naevia, Nasir and some nameless gladiators were able to make it out of the mines, but Glaber's men were still hot on their heels. The bulk of their plot revolved around them running through the forest while fighting off the Roman soldiers led by Marcus and Ashur. Every time Spartacus and his men were able to get away, they would be slowed down by Naevia, and it became clear that she would cost everyone their lives. It was suggested that they leave her behind, but Spartacus refused since Crixus sacrificed himself to ensure her survival. As the rebels trudged on, their numbers were lighted after several skirmishes, and they feared that they were about to meet their end with Mt. Vesuvius in sight, but they were saved at the very end by Agron and those who followed him. By far the most important developments that occurred in the woods had to do with character. We got a better understanding of Spartacus as a leader, and we got to see Mira prove her worth to the cause amongst all of the action. While this story was chock-full of fight scenes, it some how also dragged the narrative momentum down for a bit because it didn't feel like there was any risk involved. What made the sequences in the mines so strong was the fact that people you cared about had something to lose, and we didn't get that same sense of urgency in the forest. Yes, Nasir was wounded, but I'm sure no one really thought that any of the main characters would end up dead or captured, and we knew that Agron was going to show up as soon as Vesuvius appeared on our screens. So, while there was plenty of danger, the stakes were still relatively low, and I couldn't help but ask what was the point when it was all said and done. In Capua, Glaber and Ilithyia were not fighting off gladiators, but they were caught up in their own battles over power and position. After Varinius was humiliated at the arena, Ilithyia suggested that they make it up to him by throwing a lavish celebration in his honor. Since it's Spartacus, this was all an excuse to see a lot of flesh parade around, but there were more sinister plots going on beneath the surface. Glaber continued his feud with Varinius as they constantly tried to one-up each other in front of the people while Ilithyia tried to convince her father to dissolve her marriage so she could wed her husband's rival. Things got even scandalous when Lucretia was added to the mix. Her role as messenger to the gods was being questioned by Ilithyia, but she was able to show what she was capable of by bedding Ilithyia's father as a way to guarantee the end of her marriage and to stay in her good graces. For the first time ever, I think I enjoyed the melodramatic political and social maneuvering that was taking place over the action scenes because I seriously did not know what to expect. 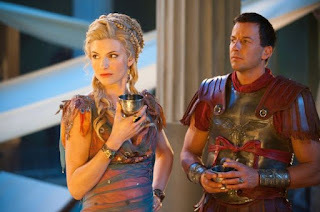 It's been clear from the beginning that Ilithyia was up to something, and her obvious flirtations with Varinius should have been a clue, but I was still surprised by her plan to leave Glaber so she could continue to improve her status within the Roman hierarchy. When you add those venomous scenes between Ilithyia and Lucretia, and it was clear that Vivia Bianca was the standout during this episode, and her character may end up being the villain of the entire piece. Crixus was not killed. He and some other captured slaves were brought back to Capua. Varinius decided that they, along with Oenomaus, would fight in the arena as a punishment. Since Glaber could not be out done, he suggested that one of the unknown rebels be sacrificed at the party which led to a particularly brutal scene where the nobles tortured and killed him for fun. Speaking of sadistic nobility, I'm starting to question the worth of Seppius and Seppia. Up until now they've only been gnats buzzing around Glaber and Ilithyia, and they contributed even less during this episode aside from their forbidden kiss. I kinda feel bad for Glaber. When is Gannicus going to show up? "Empty Hands" was not as pulse-poundingly good as "The Greater Good", but the amount of character development that occurred picked up the slack because now we have a better insight into the major players and their motivations, so the episode was ultimately a success.